Google is back to playing big-daddy yet again. After it is done with penetrating into our lives, quite literally, it is all set to enter our body. The internet search giant Google is all set to unveil a new high-tech application browser that will map out the entire human body. Termed the 'Google Body Browser', the technology would help in better understanding of the human anatomy and would help to advance medical-research. The application is in the nascent stage and will help understand the human body in the same way Google Earth explores earth. According to a report that appeared in the Daily Mail, Google has been tight-lipped about the new application and a new video has been revealed that provides a sneak-peek into the way the new tool works. "Google Body Browser also ushers in the introduction of brand new Internet technology called WebGL, that will allow complex 3D graphics to be used on normal web pages, without the need for specially adapted browser plug-ins like Flash or Java," the report says. 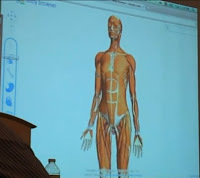 A blogger who witnessed the live demonstration of the application said, "One can quickly see the possibilities of how this could help anatomical education. Last year I got the opportunity to work on an open standards based web3D medical app for learning the bones of the body. After witnessing how that app really helped students learn the bones, I am sold on using web3D for medical education." Ahead of unveiling of the break-through technology, Google has come out with a WebGL-supported browsers or beta versions of Firefox and Google Chrome. Most new internet browsers will have WebGL as a standard. Google Body Browser can be downloaded from their Body Browser website.